Unlike other sub-species of Red-tailed Black-Cockatoo the south-eastern sub-species is an ecological specialist, feeding almost entirely on the seeds of Brown and Desert Stringybark (Eucalyptus baxteri and E. arenacea) and seasonally (January to March) on Buloke (Allocasuarina luehmannii). The distribution and flowering patterns of the cockatoo’s preferred food trees determines where the birds occur throughout the range from year to year. Red-tails are highly nomadic spending much of their time searching for the stringybark species that has produced the most recent seed crop. Desert stringybark generally produces a new seed crop every three years, while Brown Stringybark fruits every two to four years (Koch 2003). The birds prefer the newer, more recent fruit capsules as they are softer making it easier for the birds to extract the seed. 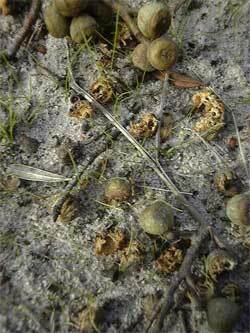 Stringybark can retain the seed for several years, however as it matures, it hardens and requires more time and effort to remove the seed. This is critical for a nesting pair as it means the nest may be left for unusually long periods of time, resulting in nest failure. Red-tails leave a tell-talelitter of twigs and chewedcapsules Unlike stringybark trees, buloke does not retain the seed in the capsule, and thus is only available for the cockatoos to feed on during late summer and autumn. 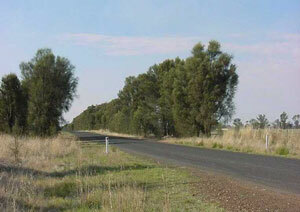 Much of the buloke is located in the northern part of the cockatoo’s range, with often quite large numbers of birds moving into the area during this period to exploit the resource whilst available. You can often see where Red-tails have been feeding by the trash of leaves, twigs and chewed nuts left underneath the tree in which the birds have been feeding. These are called ‘chewings’. If the leaves are fresh you know to keep your ears and eyes open, as you will generally hear Red-tails before you see them. 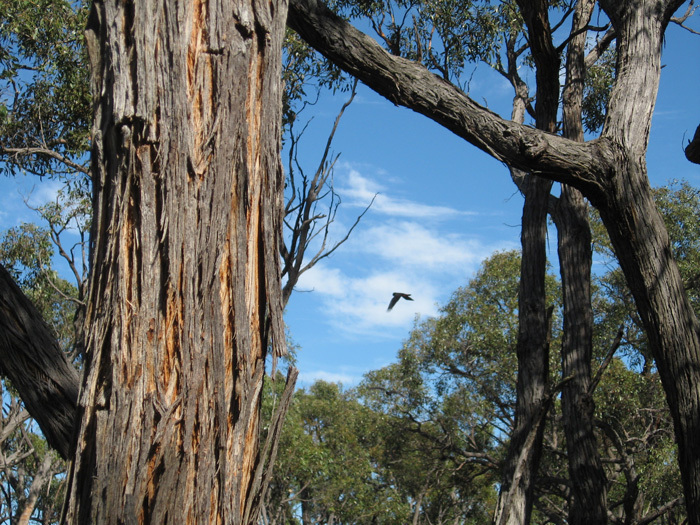 Although Red-tails rely on intact blocks of stringybark forest for feeding, scattered paddock trees also provide important feeding habitat. Paddock stringybark trees have been found to produce up to 26 times more seed than stringybark trees within patches (Maron et al. 2008), making them a highly valuable food resource for this species. 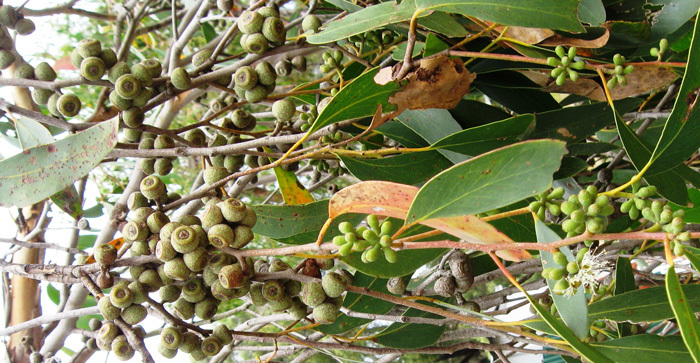 Stringybark generally occurs on sandy soils that are nutrient poor, while buloke occurs on heavier more fertile soils, which are more favoured for agriculture. 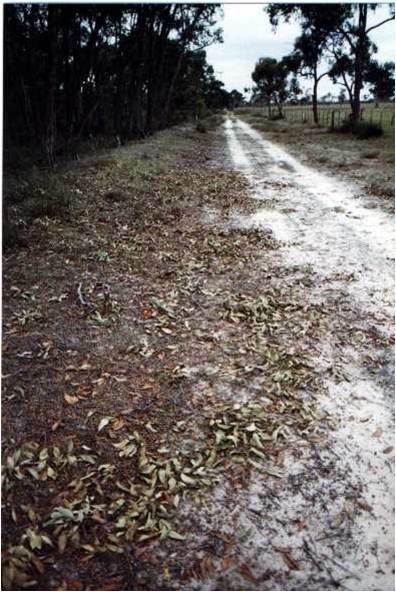 Since European settlement, approximately half of the cockatoo’s historic stringybark feeding habitat and greater than 97% of buloke habitat has been cleared. The loss and ongoing removal and decline of the cockatoo’s preferred feeding habitat is considered to be the main threat to the long-term survival of the species, with food shortages limiting population growth. 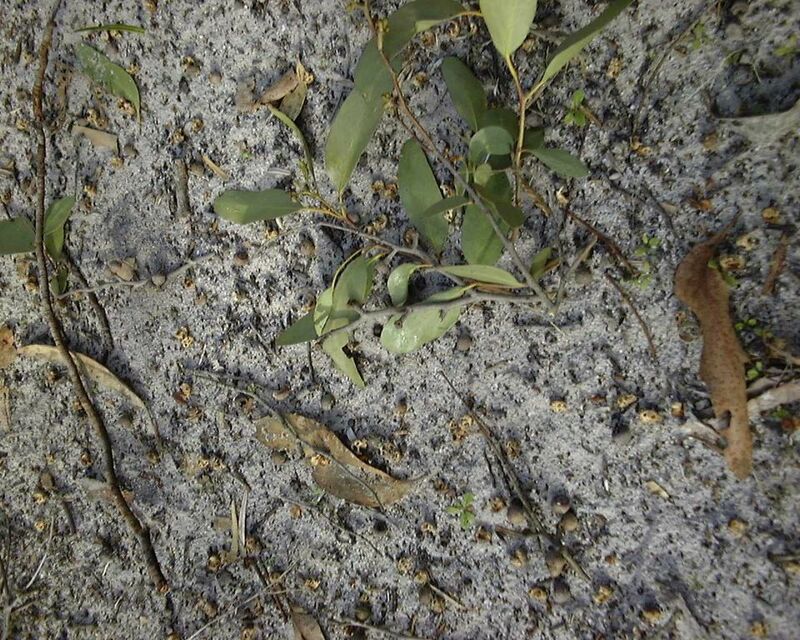 Unlike the more common Yellow-tailed Black-Cockatoo which have adapted well to the changing environment (feeding on introduced pine plantations), Red-tails haven’t found an alternative food source. 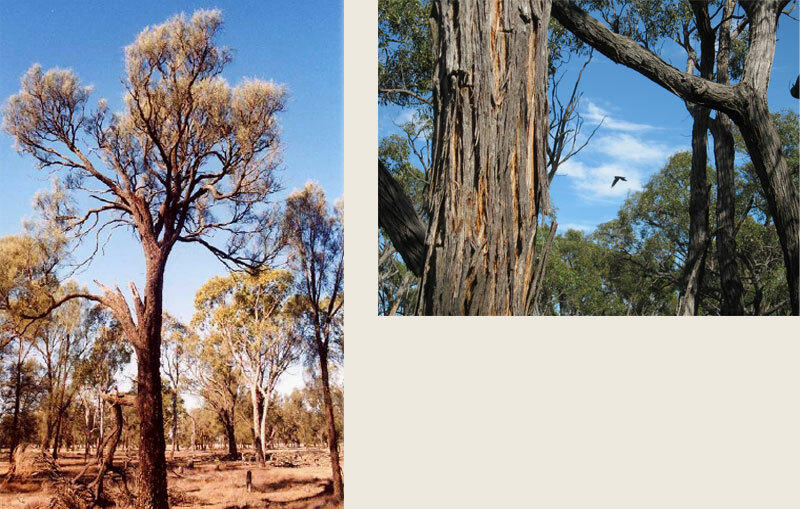 Not only is remaining stringybark and buloke habitat at risk of loss through ongoing clearance and senescence, but the productivity of these habitats also continues to be reduced through inappropriate agricultural practises, wildfires and inappropriate burning regimes, invasive wood weeds and pathogens and pests of food trees. Too frequent burning of stringybark forest has been shown to contribute to reduced seed crops (Koch 2003), with areas of brown and desert stringybark subject to canopy scorch producing on average 50% less food for 10 years post scorch. Stock grazing, particularly by cattle, can result in soil compaction and ringbarking. This has implications for regeneration of young stringybarks/bulokes and survival of mature trees. Ringbarking (removal of the tree’s bark most often by cattle rubbing up against the trunk) eventually leads to tree dieback. Invasive woody weeds such as pine wildlings can also reduce the productivity of areas as they compete with stringybark trees for light, water and nutrients. 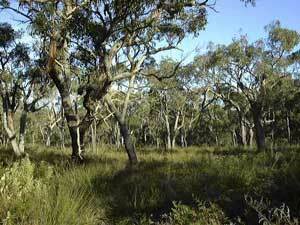 Protecting scattered feed trees and remnant patches of existing stringybark and buloke habitat from damage by stock through fencing; maintaining large areas of unburnt stringybark habitat and a low proportion of canopy scorch; control of invasive woody weeds and re-creation of new habitats through habitat restoration projects can all assist to increase the extent and/or productivity of feeding habitats and improve habitat conditions for our Red-tails.